Please keep in mind that the maximum design size for these coolers is approximately 3" x 3". If you want text on the cooler as well, you will need to limit the design's height to approximately 2" on the can coolers. On the bottle coolers, they can accommodate a 3" x 3" design plus one line of text. Designs with stitch counts below 10,000 work best on these coolers. The cost of the embroidery design will need to be added to your order. If you want multiple coolers done with the same design, you only have to purchase the design once -- it's a one time fee. Please select the dollar amount of the design below. In the order notes, please include the link to the design. If you have any questions at all, feel free to email us. 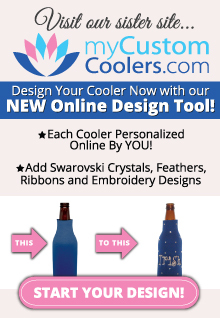 Do you have a logo or original artwork that you would like to use for an embroidery design on your coolers? As long as you own the rights to the artwork, we would be happy to give you a quote for a custom design featuring your logo or artwork. The cost of the design is determined by the complexity of the artwork, the size, etc. Please email us an image of the design and we will return a quote to you within approximately 1-2 business days.